TEL AVIV, ISRAEL—Moments after stepping out from Air Force One Wednesday, President Barack Obama reportedly greeted Prime Minister Benjamin Netanyahu at Ben Gurion International Airport, shook his hand, smiled, leaned in, and told the Israeli leader that “this is a completely pointless visit and a waste of everyone’s time.” “This trip will accomplish nothing,” Obama reportedly said out of the corner of his mouth while he and Netanyahu smiled broadly and waved to the gathered crowd. “You won’t do what I want when it comes to stopping Israeli settlements, and I can’t do what you want in terms of dismissing Palestine. 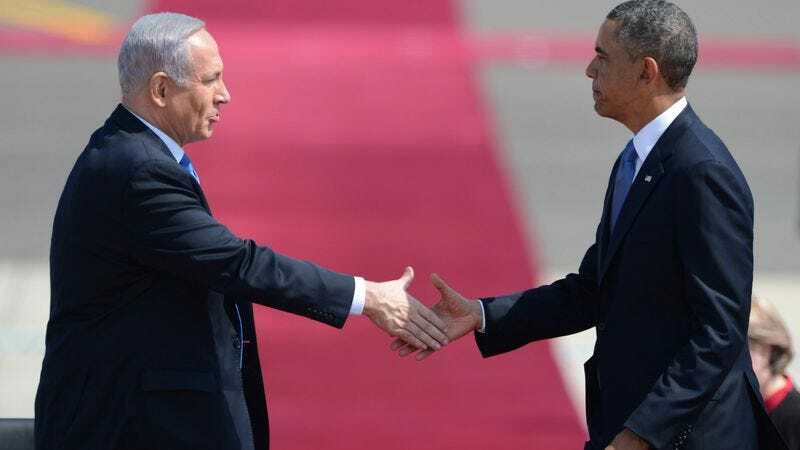 Now, pretend to laugh at what I just said so it appears like we get along.” As Obama walked up the tarmac with his arm around Netanyahu’s shoulder, the President said he basically traveled 5,000 miles for a meaningless photo op, at which point both men turned around, waved one last time, and stepped into a waiting limousine.